Schaft: 100% Prepreg Carbon, Standardlänge 87”/ 220cm, muss individuell auf Länge geschnitten werden und ist über das mitgelieferte Lever Lock™ System in einem Verstell-Bereich von 6″/ 15cm Höhenverstellbar. Der Lever Lock™ ist ein innovatives Verstell-System absolut rutschfest und verdrehfrei, und lässt im Gegensatz zu herkömmlichen Verschluss-Systemen kaum bis gar kein Wasser durch! Paddelblatt aus 100% 12K Prepreg Carbon (mit Kevlar verstärkter Spitze), PVC Kern, 12° Blattwinkel für optimale Power. Das Blatt-Design mit der abgerundeten Spitze und Konkave im Blatt ermöglichen einen sauberen, kraftvollen Paddelschlag, ohne Turbulenzen. Erhältlich in den Blattgrößen 80 und 90 (Square Inches). Even the fastest boards in the world can be faster with an effective paddle. This is why we have spent so much time retooling our paddle line (literally) from blade, to oval shaped shaft to, ergo handle. 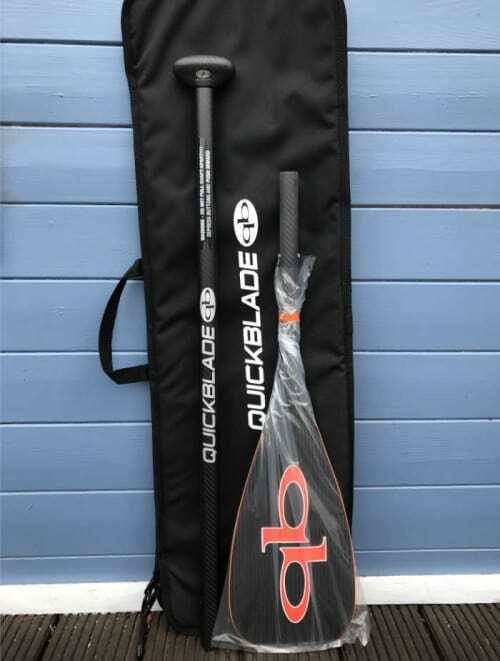 Our new blade design has been optimized to have a higher aspect ratio, more catch, and a cleaner release. This is a fancy way of saying we have made our blades even faster in and out of the water. Additionally, we wrapped the edge in ABS to protect against impact damage. Our proprietary shaft design is a tapered oval to round ID that can accept either a stardard, EVA wrapped, cut to fit, carbon handle, OR a Lever Lock 6” carbon adjustable handle for the ultimate in performance adjustability. No more cutter’s regret! You can now seamlessly change up your paddle length between surfing and racing. One paddle, more options. Our paddles come in three different constructions and flex patterns so that you can find the one that suits your performance and your price. We use 24K, 12K prepreg carbon as well as carbon / glass to optimize the strength to weight ratio. 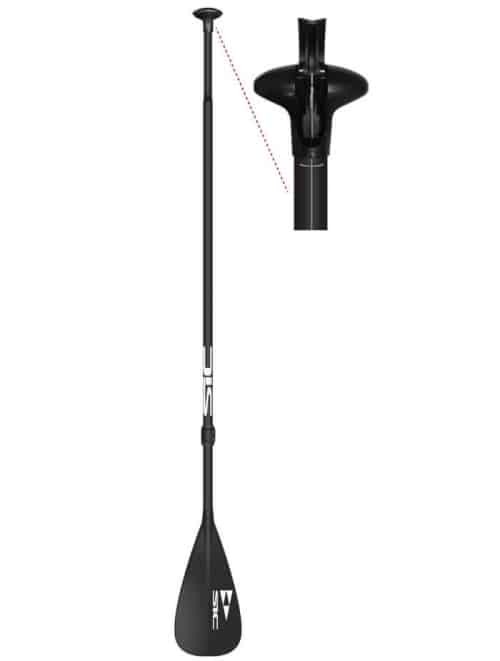 Lastly, our popular FLOW and Youth adjustable paddles have set a standard in ease of use and adjustability. These paddles are perfect for use with the whole family. 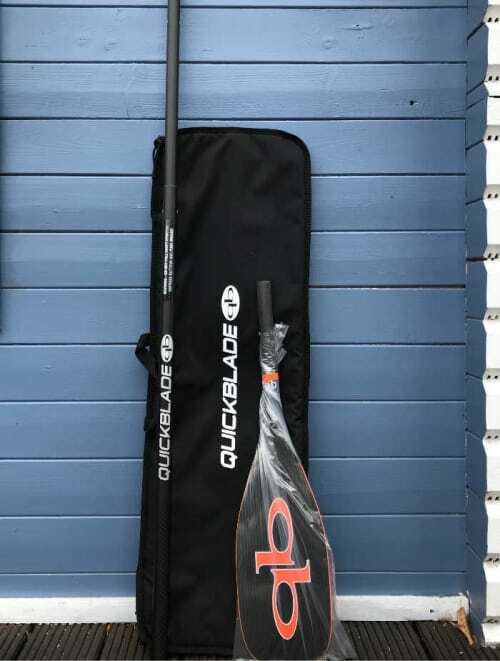 Our FLOW 2 and 3 piece feature Lever Lock™ adjustability with 16 inches of travel to accommodate anyone who wants to go for a paddle and our Youth adjustable paddles are great for kids getting into the sport.